I love this icon; it isn't true; I can't bear to give it up. Sniff. 3) How to write a book proposal (apart from "to the tastes of the particular press/editor you're pitching to"). Guess what my summer project is. I hate, hate, hate cutting things. Hate it. I'm assuming those of you who write recognize the feeling at least a little. I especially hate cutting bits I like, when they no longer fit the tone or structure of the piece they're in. Sometimes they're beautiful, or funny, or meaningful, but they just have to go. Hey, I guess that's what having a blog is for. This used to be in the fourth chapter of my dissertation, as the introduction to a subsection on my fieldwork teaching ESL in Bay Ridge, Brooklyn. I got the question every time I started working with a new group of students, and this day was no exception. "Where you from?" Wilad asked, as I put the children's book I'd been using to teach colors and clothing back in my purse. I used to answer that question with "Kensington," my Brooklyn neighborhood, or "Philadelphia," my hometown. But that's never the question they're asking. "I'm American," I say. I thought of my wife, with her Jewish last name, who was at home with our six-month-old son. "No," I say. "My husband's not Arab." My dissertation is eating my brain at the moment; one of my committee members wants a full draft in a week and a half (because, very generously, he's offering to read it and get it back to me before he gets his term papers for the semester), and I've got the WPSA all next week, so it's write-all-the-time mode around here. This has gotten me thinking about the very material aspects of writing: the physical action, and the sort of things we do in order to make it possible. 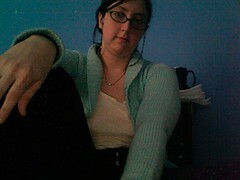 So, for instance, there is the category of clothing called "a writing outfit." All of these elements are about combining comfort and ease into a single packet, to make the process of writing as simple or easy as possible. 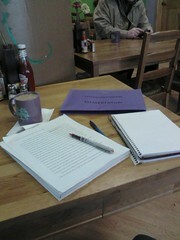 Or this is my workspace at the cafe down the street from my house when I was editing two weeks ago. A red pen, preferably a rollerball with liquid ink. I could have edited in green or purple, or blue at a pinch, but black would have been impossible--I need the visual distinction from the print of the page. This pen is somewhere between red and magenta, and I rather like it. A notebook for writing down major tasks still to do or things to look up. I could have done this on my iPod, which often does this task for me, but since I was working on paper already, the notebook did the work efficiently. Some means of organization. I am a terribly organized person; one folder which can contain all of the above supplies and keep them in order so all I have to do each morning is pick it up and leave makes my life so much better. Caffeine. I have drunk so much coffee in the last month, you would not believe if. Somewhere to work that's not my house. While I can work at home, I prefer not to. Some of it is that I don't have a good office space in the house; while I did, until just this week, technically have a desk in my bedroom, it both got sacrificed on the altar of needing more floor space as my kid gets older, and wasn't really functional. I find I focus better and produce more material more quickly if I'm doing it somewhere else. Eventually, I aspire to either A Job That Comes With An Office, or the income to rent time at the Brooklyn Creative League or somewhere similar. So that's my process. What's yours? Where do I buy a peak-fare ticket to Productivity Junction, please? I'm sitting here, with my cup of tea, watching the snow that fell this morning on the half-melted remains of the last storm, and contemplating what the hell I'm supposed to do next. I just hit a fairly pleasant milestone: I completed the first draft of my final substantive dissertation chapter. (For the record, this means I have an introduction and a conclusion to knock out, and some revisions; some of those revisions will take work, and some of them will involve a good reread and a few days of pacing around and red-penciling.) At the same time, since I'm unscheduled this semester, I don't have pressing needs like syllabus writing, teaching, grading (although, oops, I haven't uploaded last semester's grades yet...I should do that), meetings, or the assorted detritus that fills up one's time. But these two facts conspire to result in a great floundering period. What, precisely, should I do next? Where should I go? What are my priorities? Even once I've chosen a new project, how do I frame my progress on it? I usually start out using these floundering periods as a way to play catchup. Yesterday, I went on Proquest Dissertation Abstracts and searched for "Arab-American," and did some searches to find dissertations that looked interesting. (I now have two whole dissertations sitting on my Kindle, and a bunch of the Proquest samples, and a couple of others that have made it into print to go find in paper copy. Whoo hoo.) I also used the excuse of a trip to Manhattan with only one scheduled event to run by the library and return old books and pick up new ones. (Amazingly, of the 3 books I went looking for, I only found one. 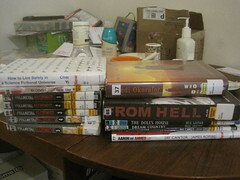 And yet, also amazingly, I left with three books. Oh, Library of Congress system, never fail me with your suggestion of interesting and related texts.) So, that's sorted. But this only gets me so far. The problem is that these gap moments are a great way to get stuck. Oh, I can't possibly start on $nexttask (and, by the way, that I used that syntax to phrase this problem is entirely due to hanging out with People What Write Code here on DW, so, thanks, I guess), because I have all these dishes to wash/books to read/navels to gaze at. Oh, I should really be making that chapter an article/turning that old paper into an article/writing more abstracts for more conferences/whatever, so I should start on that, except I never do, I just kinda...stare. I don't have time to get stuck. Stuck is bad. Very bad. So now it's time to break out of Stucks-ville. I mean, maybe I'll spend this weekend reading other people's dissertations and drinking tea and being emo contemplating my goals as a dissertation-writer. But on Monday, I need to sit down and take the train to Productivity Junction. Set a clear self-imposed deadline. The one I'm working with right now is "a draft introduction, partial and with gaps where necessary, before I leave for my visit to my in-laws in two weeks." Possible (I'm a fast writer, and I'm planning on having the intro clock in around 25pp, so that's not too many words) but will require concentrated effort, and won't screw me if I don't meet it. Write a detailed outline, complete with suboutlines. By which I mean, I should list the parts of the chapter, and then the sub-parts of each part, and if I can outline the sub-sub-parts that's even better. This is my technique for writing quickly. If it's a matter of filling in holes, then I just fill them as the mood moves me, and eventually fill them all, put them together, and then edit the crap out of it (moving sections, rewriting where I've used things twice or been inconsistent, changing the framing argument where I've written myself to a new one, etc). Um. This is where I start running out of techniques. As you'll notice, I run out of steam mid-plan there. I'm sure that the later steps should be somewhere on the order of WRITE ALL THE THINGS, but...does anyone have any techniques they use, in order not to lose a bunch of time to this transitional moment? Not that a little bit of tea-and-emo ever hurt anyone. In conclusion, I'm right? The end? Trust me, I nearly considered circulating it like that. Hey, it's August; I'm not at my best. 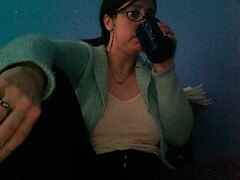 However, I forced myself to sit down, armed with a large iced coffee, and write a real conclusion. Without any real advance planning, this is what came out--and I rather like it. In writing this paper, I have hoped to describe the way these two groups, Adalah-NY and Al-Awda, engage in political life very differently: their preferred rhetoric, their alliances with other groups, and their relationships to the identities of their members and allies all vary highly, and in ways that make sense given the different segments of Arab’s New York and progressive/radical communities that house them. If, at the very least, I have contributed to an effort to disaggregate the understanding of what Palestine activism is in the contemporary United States, I consider that I have produced useful intellectual work. At the same time, I’d like to suggest some of the larger ramifications of this work for thinking about social movements. Too often, radical movements with low probability of achieving their goals are viewed only as foils for more moderate movements, the ones who are likely to win concessions, in part because of tensions between radical movements and the nervous centers of power. I want to suggest that there are important reasons for not treating groups like Al-Awda and Adalah-NY as afterthoughts. Empirically, the way that the margins battle over the meaning of their work ends up moving down into more centrist groups: the way the language of boycott, even if substantially divorced from the original context of the BDS call, has moved into mainstream Palestine activism, is a sure sign of this. If we want to see where mainstream movements are going, we must look to their margins. Normatively—and I believe we are as required to normatively justify our work as we are to methodologically justify it—we cannot ignore voices on the margins, because they represent political actors making arguments that demand a full hearing. Without being able to hear the argument within any set of claims made, and being able to address the fundamental question of justice that beats at the heart of it, political society will be unable to aim for full incorporation of all members. I mean, it says the exact same thing--just more belligerently, really.